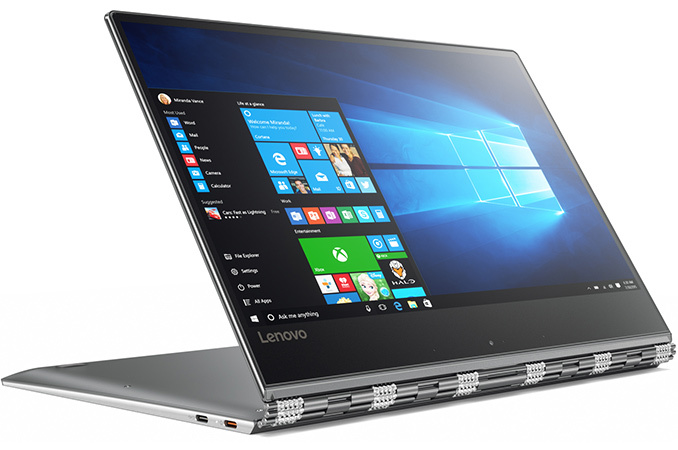 Lenovo this week took the wraps of its new Yoga 910 convertible, an aluminium 2-in-1 equipped with a 4K UHD display and is based on Intel’s upcoming 7th generation Core processors codenamed Kaby Lake. The Yoga 910 inherits distinctive form-factor from the previous-gen Yoga 900 laptops, makes it slightly thinner and adds a fingerprint reader to the familiar design. 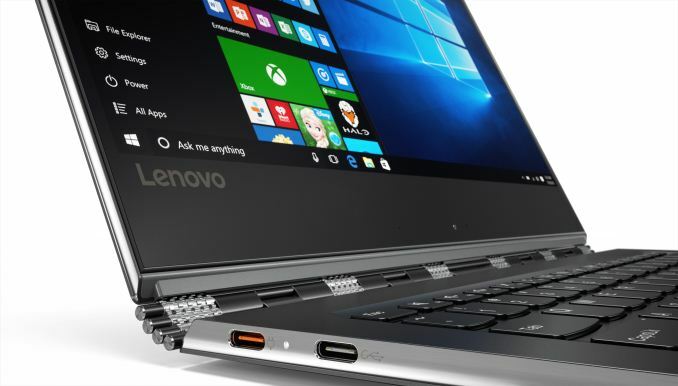 The Lenovo Yoga 910 is the direct successor of the Yoga 900 introduced last year, which at present is Lenovo’s top-of-the-range offering in the Yoga lineup. The new Yoga 910 will not only offer higher performance (something that is logical to expect from a PC based on a newer CPU), but also a slightly larger 13.9” IPS display panel with either 4K (3840×2160) or FHD (1920×1080) resolution. Thanks to thinner bezel, the larger screen does not affect dimensions of the convertible, and in fact the new model is even a little smaller and thinner (14.3 mm vs 14.9 mm) than its predecessor. Still, it is noteworthy that the Yoga 910 weighs 1.38 kg (3.04 lbs), which is around 80 grams more than the weight of the Yoga 900. When it comes to battery life the UHD model can offer 10.5 hours on one charge (in line with current models that have 3K displays), whereas the FHD promises to work for up to 15.5 hours (which is a massive improvement over current SKUs). Dimensions 13" x 9" x 0.5"
330.2 x 228.6 x 12.8 mm 12.75" x 8.86" x 0.59"
324 x 225 x 14.9 mm 12.72" x 8.84" x 0.56"
Lenovo has not revealed the complete specifications of the Yoga 910 just yet, but they note that it will use Intel’s Core i7 "Kaby Lake" 7000-series CPUs, up to 16 GB of RAM, a PCIe SSD (with up to 1 TB capacity) and will be equipped with a 802.11ac Wi-Fi + Bluetooth 4.1 module, a 720p webcam, a dual-array microphone, two speakers made by JBL, as well as a fingerprint reader compatible with Windows Hello. For wired connectivity, the Yoga 910 has one USB 3.0 Type-C with video out functionality, one USB 2.0 Type-C for charging as well as one USB 3.0 Type-A port with always-on charging capability. When Lenovo’s Yoga 910 laptops hit the market in October, they will be available in Champagne Gold, Platinum Silver and Gunmetal colors. Apparently, Lenovo is dropping its signature Clementine Orange color it uses for consumer notebooks in case of the Yoga 910. As for prices, the new convertibles will start at $1299, which is a $100 increase over current-gen models.